If pesticides and herbicides worked so well, we should be able to use less of them, not more, right? It just isn’t the case, though. On American farms and gardens, we have gone from using around 100 million pounds annually to over 404 million pounds of pesticides each year. That’s a whole lot of toxic junk on our foods and in our ecosystem. Today’s genetically engineered crops aren’t reducing the need for pesticides and herbicides; they are quadrupling them. The use of 2,4-D alone could drive the use of these toxic chemicals up another 50% in just the next few years, alone. Ever wonder if that might be the reason that Monsanto keeps pushing GMOs? They are already making millions on their best-selling herbicide RoundUp, and by selling ‘RoundUp Ready’ crops, they are actually ensuring the future need of more of their toxic brew, or brews. In fact, reductions in insecticide use in Bt-transgenic corn are now in jeopardy as a result of the emergence of corn rootworm (CRW) populations resistant to the Cry 3Bb1 toxins expressed in several corn hybrids. This is basically a biotech dream-come-true. Glyphosate was developed in the 1970s by Monsanto, along with other toxins like DDT, Agent Orange, and cancer-causing bovine growth hormones (BGH). This company is in the business of selling toxic chemicals. The more toxic chemicals we use, the more they say we need – hence the sale of even more toxic chemicals. It’s a round robin that never stops – why killing all the robins! Why, on God’s Green Earth would we ever allow a company in the business of selling toxic chemicals decide to tell us if something is safe or good for us? That’s exactly what Monsanto and the Grocery Manufacturer’s Association expect from the legislature and FDA. This is serious. 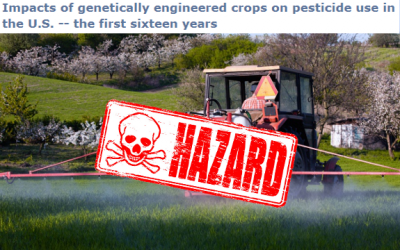 It means more testicular cancer, leukemia, and brain cancers with increased used of pesticides. If genetically modified crops take over organic crops through cross pollination, then all of our crops will not only be toxic from the pesticides poured over them, but from the toxic recombinant, transgenic species within the plant itself. These companies are playing with poison, not trying to feed the world. This can only lead to a toxic body, a toxic environment, and mutated plants, animals and people. It has to stop. You can start making a difference by signing a petition to tell the FDA to stop allowing pesticides that are killing our honey bees, and then refuse to purchase pesticides or Round Up chemicals from your community gardening centers, while also telling them to stop selling them, here.